Heat the oil in a large non-stick skillet over medium high heat. Add the garlic and cook until browned and crisp, removing pieces as they brown with a slotted spoon, about 2 minutes altogether. Pour the oil into a heatproof cup. Sprinkle the chicken with 1/2 teaspoon each salt and pepper. Transfer 2 tablespoons of the garlic oil back to the skillet. Heat over medium-high until almost smoking and add the chicken. Cook until golden on the bottom, about 7 to 9 minutes. Turn and cook another 7 to 9 minutes or until golden and cooked through. Remove to a cutting board. Let stand 5 minutes. Whisk the lemon juice, vinegar and honey into the remaining garlic oil. Season with 1/4 teaspoon each kosher salt and freshly ground black pepper and the cayenne. 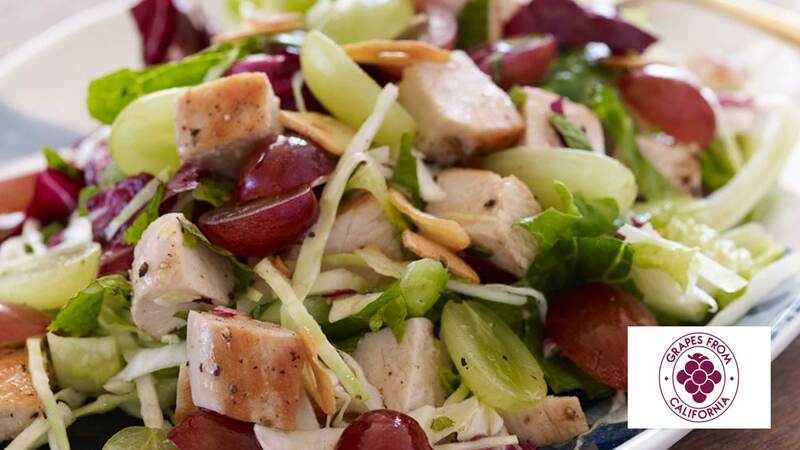 Combine the romaine, radicchio, cabbage, grapes, celery and mint in a large bowl. Chop the chicken and add to the bowl along with the dressing. Toss to mix and serve sprinkled with the crispy garlic.